Can our law firm add a handling fee to credit card transactions? In the state of Florida, no. For other states, please review rules and regulations. Surcharges and convenience fees fall under card acceptance (Visa, Mastercard etc) rules, as well as legislative, such as state statutes. What is a Surcharge? A payment card surcharge is a fee that a retailer adds to the cost of a purchase when a customer uses a payment card. It must be disclosed in advance and listed separately on the receipt. 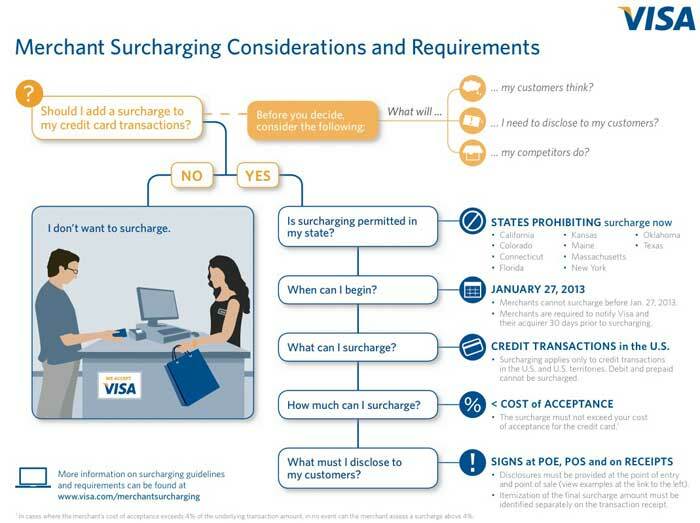 Surcharges are newly possible in 2013 due to a recent Visa & MasterCard class action settlement, however, not only do a number of states prohibit surcharging, as a result of the new rule, many more states are working feverishly to establish laws to prohibit surcharging. What is a convenience fee? A credit card handling fee or convenience fee is a fixed or flat amount added to the transaction using an alternative payment channel outside the Merchant’s customary payment channels (example, i.e., not solely for the acceptance of the Visa Card). The amount must apply to all payment methods offered via that channel. Basically you’re not paying a fee for using the card, you’re paying a fee for using the payment channel, such as over the phone. Can I discount based on payment type? Under the Dodd-Frank Wall Street Reform and Consumer Protection Act merchants were given new flexibilty to steer customers to lower cost payment methods, For example, a 1% discount could be extended for using debit cards. Merchants are prohbited from steering to a specific card brand. (1)?A seller or lessor in a sales or lease transaction may not impose a surcharge on the buyer or lessee for electing to use a credit card in lieu of payment by cash, check, or similar means, if the seller or lessor accepts payment by credit card. A surcharge is any additional amount imposed at the time of a sale or lease transaction by the seller or lessor that increases the charge to the buyer or lessee for the privilege of using a credit card to make payment. Charges imposed pursuant to approved state or federal tariffs are not considered to be a surcharge, and charges made under such tariffs are exempt from this section. A convenience fee imposed upon a student or family paying tuition, fees, or other student account charges by credit card to a William L. Boyd, IV, Florida resident access grant eligible institution, as defined in s. 1009.89, is not considered to be a surcharge and is exempt from this section if the amount of the convenience fee does not exceed the total cost charged by the credit card company to the institution. The term “credit card” includes those cards for which unpaid balances are payable on demand. This section does not apply to the offering of a discount for the purpose of inducing payment by cash, check, or other means not involving the use of a credit card, if the discount is offered to all prospective customers. (2)?A person who violates the provisions of subsection (1) is guilty of a misdemeanor of the second degree, punishable as provided in s. 775.082 or s. 775.083. History.—ss. 1, 2, ch. 87-43; s. 3, ch. 2010-219. Use technology that automates interchange optimization. In short, your fees are lower because transactions are ‘qualified’. Ensure your merchant account supports level 3 data, required for the lowest qualified interchange rates for corporate and purchasing cards. Get a merchant account with ‘pass through’ interchange fees. This enables the firm to take maximum advantage of both items above, including reduced rates for large ticket transactions. Is there a credit card transaction limit for my merchant account? This entry was posted in merchant account Q&A, online payments and tagged convenience fees, credit card processing, surcharge, visa by Christine Speedy. Bookmark the permalink.